I am so excited to share with you today’s post! It is that time of the year again. Falling leaves, sweater weather (at least for some of you), pumpkin spice, and the Fall Coffee Lovers Blog Hop! I’d like to take this opportunity to thank Amy Tsuruta and the rest of her team responsible for facilitating this great hop! I don’t know how you guys do it but you all rock! Today I made a card showcasing products from the #KatScrappiness shop (www.katscrappiness.com). THERE IS A SPECIAL COUPON CODE at the shop from September 15th to September 22nd only, so hurry and shop for all the crafty products you’ve always wanted (use coupon code: “COFFEEHOP” for 15% off your order). THERE IS ALSO A GIVEAWAY! Kat is a super sponsor and is giving away a $25 gift card from her shop. 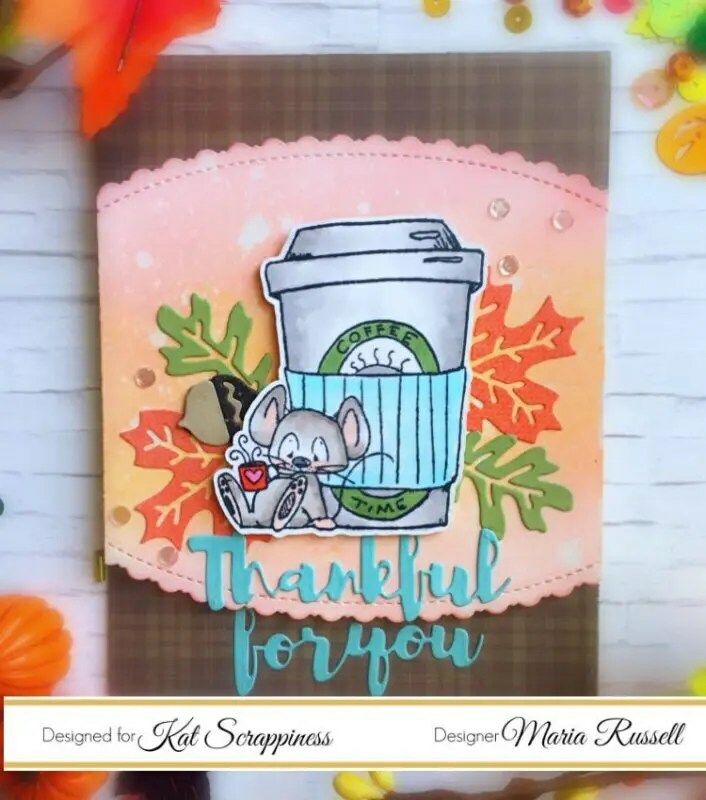 Please check all of the details for the giveaway on the www.coffeelovingcardmakers.com. Here’s my card today and I also have a process video for you if you’d like to see how I made the card. I didn’t have the dies for this stamp set so I will also show you how I cut the image, using my Brother Scan N Cut 2. I love this machine and even though it is quite the investment, it will save you money because you don’t really have to buy coordinating dies anymore. [The part where I was showing you how I used the ScanNCut on the video was a bit shaky so I apologize for that. It was hard to film and do the cutting at the same time. I will be better next time] . And here’s my process video. I hope you like my card. The supplies I used are listed and linked below. Have a wonderful day! I listed all of the products I used below. Click on the link to go directly to the product. Where available, I used compensated affiliate links which means if you make a purchase I receive a small commission at no extra cost to you. Thanks for your support.